From the first episode, I worried You, Me And The Apocalypse might contrive a last-minute miracle (scientific, astronomical, or religious) to save everyone: a consequences-free, happy-clappy easy out. The show revels in the chaos and gravity that global destruction lends its interconnected lives, but chaos and gravity have consequences—physical, emotional, or moral—for the characters, for the story, and for the entire planet portrayed in it. I feared that at the very end, the writers would chicken out. 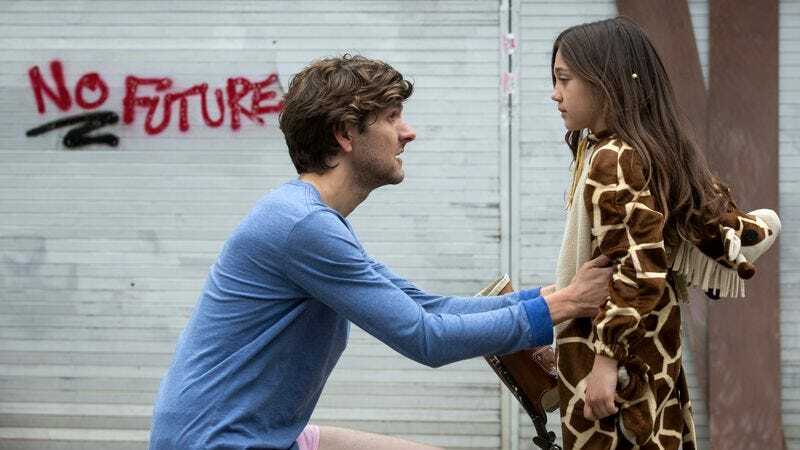 “End Of Days” (written by series creator Iain Hollands, directed by Saul Metzstein, and known in its Sky 1 debut as “The End Of The World”) has some flaws, but coddling its characters isn’t one of them. They have some luck (like Layla stepping into view just after Jamie resolves to stop looking for her) and an actual miracle (the Thames parting at Jamie’s command), but the finale doesn’t shy away from devastation. The extinction-level event promised in the first episode isn’t diverted or even mitigated, not by the efforts of Operation Savior, not by the God that presumably parted the waters for Jamie. Meteorites smoke across the sky, fouling the air and smashing towns to rubble, blocking out sun, extinguishing life. Outside the bunker, there’s no hint of hope for survival. There’s no softening of the blow, no pretending the devastation is less than total. It’s the end of the world, and no one feels fine. The emotional devastation is worse. Desperation makes people do crazy things, daring things, loving things… and terrible things. In a moment that genuinely shocked me, when her attempted carjacking fails, Rhonda shoots the driver, then tries to justify her violence. “He was going to die anyway, right?,” she says to Rajesh, pleading for reassurance. “In a few minutes?” But neither he nor Spike let her off the hook, no matter how grateful they are for their last chance at survival. When Rhonda draws her gun again, commanding Larssen to stay outside the bunker and close the faulty door, Rajesh can’t stomach her callousness. This moment manages to be both the emotional centerpiece of the episode and its only significant cop-out. Rajesh has never been a character in his own right. He started as an abstraction, Rhonda’s terminally ill husband tucked out of sight in a hospital. Then he became a MacGuffin, someone Rhonda needed to reach. Finally, he’s a sacrificial lamb. Rajesh gives up his life (however short, with the bunker’s limited medical facilities) not to save Rhonda’s life, but to save Rhonda. He’s listened to her extol the survival skills of her white-supremacist fellow fugitive and the calculating specter of a mother who’s reclaimed her in the world’s last days. “Don’t be Leanne,” he says, “don’t be your mom. Be you.” Survival means nothing if it isn’t you who survives. Ariel would agree with that, but not the way Rajesh means. His last words to Rhonda convey how important it is to retain your essential self, even in mortal danger—and Rajesh should know. Ariel doesn’t care what he has to do, who he has to be, so long as he survives. The look that flickers across Layla’s face as she realizes he’s taken Jamie’s place is as devastating as the comet. Just as Scotty and Arthur are the show’s true love story, Leanne is its unexpected harbinger of hope in the face of destruction. In the very first episode, You, Me And The Apocalypse flirts with, then discards, the easy route of making Leanne’s virulent prejudice a pretense. (“So you’re not a white supremacist?” Rhonda asks, voice lowered conspiratorially, before Leanne disabuses her of hope.) Instead, her epiphany of her own close-mindedness is slow, uncertain, and reluctant, brought about only by the betrayal of her own family and the literal end of the world. But Leanne is open to change, to admitting that her core belief—one she clings to so firmly, she’s carved it into her forehead—is just plain wrong. Rhonda admires the tenacity that makes Leanne a survivor and Arthur calls her a dinosaur, doomed to extinction, but Leanne’s adaptability is her most hopeful trait—and the show’s. There’s plenty to pick at in “End Of Days,” and in the handful of episodes since my previous review. The writers can’t resist turning subtext into text. Arthur follows “You’re a dinosaur” with a belabored “You know what happened to dinosaurs last time around? They got wiped out. By a comet.” When he and Leanne both tell Rhonda, “If you hadn’t have done it, I would have,” Leanne adds, “Well, General, it looks like you and me have a few similarities,” as if the audience needs explanation. And it’s impossible to overstate Rajesh’s shoddy treatment. 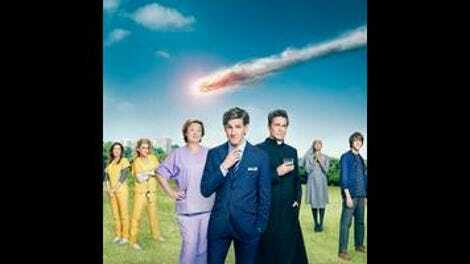 But overall, You, Me And The Apocalypse is a solid, often laugh-out-loud funny, sometimes surprisingly solemn disaster dramedy. It’s full of excellent performances, great comic timing, and deftly interwoven stories. The show earns its gravity, and it doesn’t shirk from the consequences of the scenarios it devises. There’s nothing else quite like it, and I wish there were. That’s it for You, Me And The Apocalypse! Thanks for reading all the way to the end of the world.